Disability sport will recover from the shock of Oscar Pistorius's murder arrest, says International Paralympic Committee president Sir Philip Craven. Multiple Paralympic champion Pistorius, 26, denies murdering girlfriend Reeva Steenkamp at his South African home. "This is something over time we will get over," Craven told BBC Sport. "We will move forward with our job of promoting the Paralympic movement and letting our athletes perform." Reports suggest police found performance-enhancing drugs when they raided Pistorius's house following Steenkamp's murder. 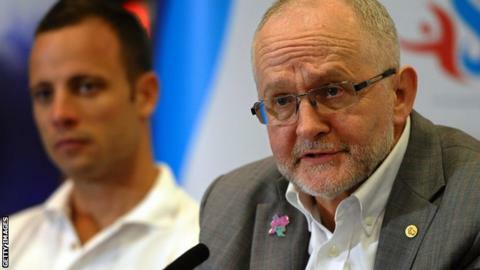 Sir Philip Craven says the South African athlete passed two drug tests at London 2012. "I know two tests were done, one out of competition and one in competition. Both of those test were negative," he said. Prosecutors accuse Pistorius of the premeditated murder of Steenkamp, 26. In a bail hearing on Tuesday, Pistorius told the court through his lawyer: "I had no intention to kill my girlfriend." Craven, in an open letter on the IPC's official website, insisted "a wealth of high profile athletes" will still build on the momentum created by London 2012, despite the controversy surrounding the Pistorius case. "The profile of our athletes has never been higher, nor has the demand to watch Paralympic sport," he said. "Together it is our job to continue building this profile regardless of the outcome of this terrible case." British Paralympians won 120 medals at London 2012, which also attracted record ticket sales and unprecedented media coverage. A BBC survey suggested 75% of Britons felt more positive about the role of people with disabilities in the UK following the Paralympics. Craven also told the BBC he felt "sad" at seeing Pistorius, who has won gold medals in each of the past three Paralympics, weeping in the dock during Tuesday's hearing. "Obviously sadness is very much in there and particularly sadness for the family of Reeva Steenkamp," he said. "Also of course thinking of Oscar and thinking of what a great athlete he has been. "But this is something we have to get over, the initial shock." Pistorius became the first double amputee to run in the Olympic Games at London 2012.